Sometimes we through our children into the world and forget to prepare them for the way. Establishing rules, responsibility, and the handling of money is a great way to establish children into future success. Saving money and completing chores can start at any age, with my kids it began at age 2! 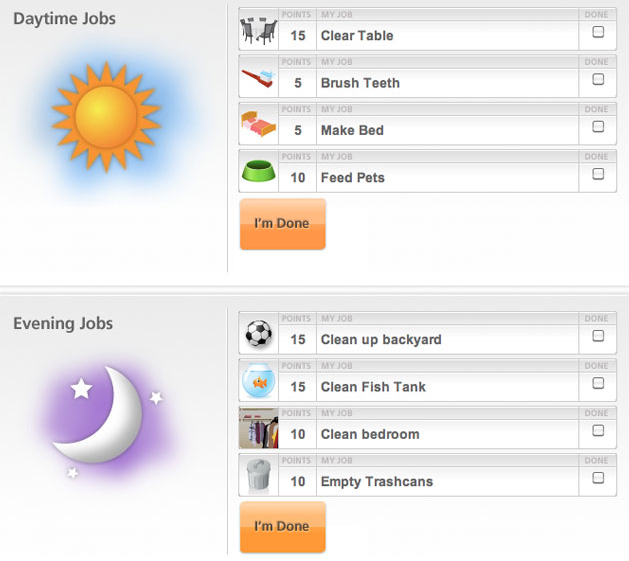 Sign up for the FREE Kids Job Chart to help motivate your kids into completing their household assignments! You just create and categorize a list for your children to complete on a daily or weekly basis and they will earn points which they can use to save! With their completed assignments,t hey can spend on Amazon products that you approve, or donate to charity – Kinda cool – Save, Teach Tithe! What a great way to teach the kids responsibility and have fun doing so in the process! Also, remember that Chore/Job Chart I’ve shown you that I created? Here it is again! This was organically made for my 3 year old. Feel free to download and customize to your liking or child’s age. Laminate it too OR put in a picture and use dry erase to keep track! There are cute ideas at the top of the post, also found on Pinterest. One idea from MadtownMacs, another from Moss Moments and the last from The Happy Housewife. Grab your FREE Online Chore Chart Today!